Last April, the European Union held a design contest open to art & design students from the 27 EU Member States in an effort to find a design for their new ‘green’ logo, which will appear on organic product packaging in Europe beginning this summer. To narrow down the winner out of the near 3,500 submissions received, designs were first evaluated by an international jury headed by Rob Vermeulen, former President of the Pan-European Brand Design Association. After a number of rounds to determine a potential winner, the jury chose three finalists and determined the winning design by putting these finalists to a public vote. The winning design, known as the ‘Euro-Leaf’, was created by German student, Dusan Milenkovic. It incorporates the 12 stars that currently adorn the flag of the European Union cleverly arranged in the shape of a leaf. The mark won over 60% of the public vote, earned Milenkovic over $8,000 in prize money and sealed the fate of his design to appear on the packaging of European organic products for years to come – not bad for a student. “It is a very straightforward sign… soft-footed and elegant. It is not a dominant one, it is low profile in a gentle way… it won’t compete with attractive private, regional or national logos, but it will add a congenial ‘green European element'” (Urs Niggli, Director of the Research Institute of Organic Agriculture). Putting a few design flaws aside, it’s as wonderfully simple as it is beautiful – a key aspect of identity design which makes this mark easy to remember/recognize and reinforces the European Union’s affiliation with the mark through an intelligent use of existing symbolism. 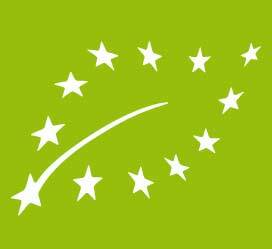 Starting in July, the EU has mandated this new mark be displayed on pre-packaged organic products originating from Europe alongside any other private, regional or national logos appearing on product packaging. Check out some of the other submissions on Facebook.